Small Changes to Your Marketing. Big Profits for Your Business. 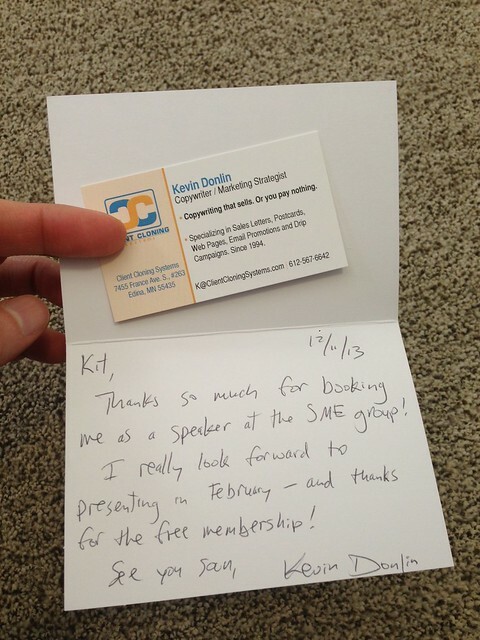 Here's my thank-you note for the day, written and mailed to Kit Welchlin to thank him for booking me to speak at an upcoming Sales and Marketing Executives event. Why mail a thank-you note for something like this? First, it's the right thing to do. Sales and Marketing Executives are among the best prospects for my copywriting and "profit recovery" services. And Kit just gave me a venue to position myself as an expert in a roomful of my ideal prospects. So a thank-you note is definitely in order. Second, I just gave Kit one less thing to worry about. Because, if I'm conscientious enough to handle a "little thing" like writing and mailing a thank-you right after we spoke on the phone, it proves that I can handle the big things. As a result, Kit won't have to worry about me showing up an hour late, or at the wrong address or drunk, or otherwise making him look bad as the event planner. Thank-you notes are old school, sure. They're also impossible to get caught in a spam filter, which makes them infinitely more effective than a thank-you email. Writing and mailing thank-you notes to prospects, clients, and referral partners can help make your business 100% referral-driven. It's done that for my business, in less than 3 years. 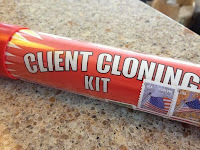 Meanwhile, if you want to put an end to "feast or famine" syndrome in your business, my free Client Cloning Kit can help. It's not some cheapo download -- this is a real business-building kit you can hold in your hands. Grab your free copy now, while they last. I deliver more clients like your best clients. How? By increasing your web site conversions, creating upsells, and writing your email promotions. Then, I expand your reach with direct mail. This one-two marketing punch -- online and offline -- works wonders. Or you pay nothing. How Many Contacts Does it Take to Make a Sale?